IL Slip and Fall Accident Injury Damages | Hupy and Abraham, S.C.
What if your fall was not just an unfortunate accident but instead was the result of someone else’s negligence? What if you fell because of a dangerous condition that the property owner knew about—or should have known about? Then, you would be entitled to damages if you had the evidence to prove your case. Slip and fall cases are often vigorously defended by property owners and insurance companies, so it is important to know what you can recover and to contact a slip and fall lawyer for help getting the damages that you deserve. Medical bills. You can recover the money you spent on medical treatment, devices, hospital stays, and any other costs due to the accident. Loss of wages and future earning potential. If the accident causes the victim to miss work or left her unable to continue to work in the future, the victim can sue for the loss of income. Pain and suffering. Pain and suffering damages include physical pain resulting from your injury. The damages are based on the severity of the pain and how long you will likely be in pain. Out-of-pocket costs. This includes things such as transportation costs, child care expenses, and damages to property that were caused by the slip and fall. 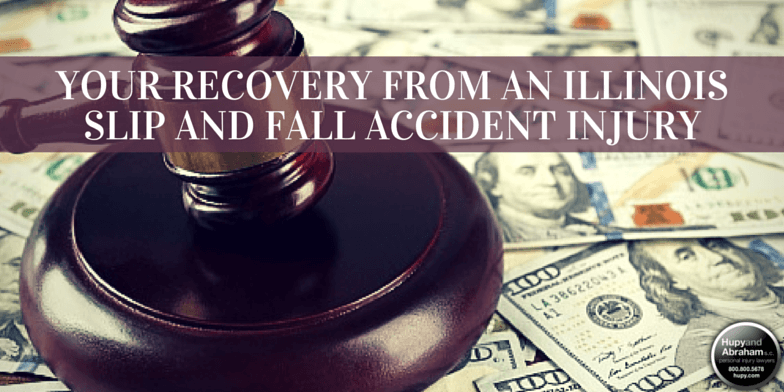 While you may be legally entitled to these damages, your recovery will not be automatic. Before you recover the damages described above, you will need to prove that the property owner’s negligence caused your accident and that the accident resulted in your injury. An experienced slip and fall lawyer can help you get the evidence that you need and can work toward your fair recovery. For more information, please schedule a free consultation with us by calling us directly at 800-800-5678 or contacting us via this website.